BTT - What is BitTorrent's new cryptocurrency token actually for? 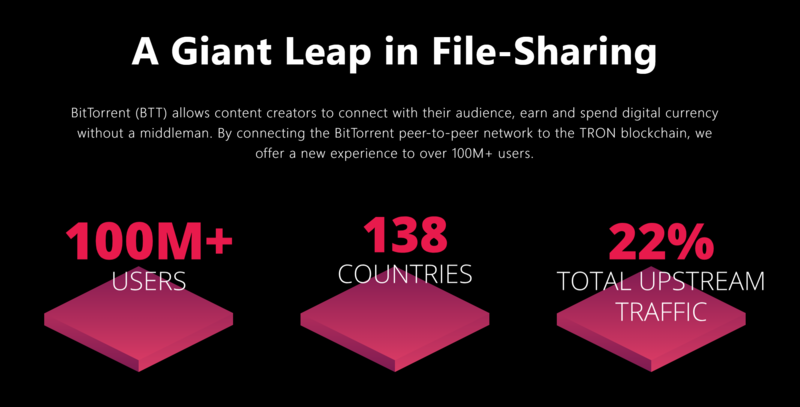 BitTorrent, the world's largest filesharing protocol, has recently launched its own cryptocurrency token in partnership with TRON (TRX). But what exactly will the BTT token be used for, and will it be a success? The recent BTT ICO, which followed an initial $20 million private token sale, was one of the most successful of the last year or so. After being launched on the Binance Launchpad platform on January 28, the public token sale was completed within 15 minutes, raising a total of $7 million. Demand for BTT was so high that technical issues on the site prevented some investors from accessing the sale, and a separate airdrop was arranged to make up for their being shut out. Read more: BitTorrent (BTT) ICO raises $7 million in under 20 minutes; What went wrong with the BTT token sale? The hype surrounding BTT has continued to last beyond this popular ICO, leading to the token experiencing a 10x growth in market cap in its first week of trading, so there certainly appears to be some perception of inherent value in BitTorrent's new token. Let's take a look at the aims and potential use cases of the BTT project, to see whether or not this confidence is justified. BTT is a TRC-10 token, built on the TRON platform. It is designed to integrate with the BitTorrent protocol, which was launched back in 2001. BitTorrent was one of the internet's first decentralized networks, and remains one of the most popular, with over 100 million monthly users. According to the BTT whitepaper, the first major implementation of BTT will be as a way to make the process of filesharing more efficient for users. Sharing a file on BitTorrent involves a number of different 'peers' each downloading small pieces of a particular file from each other. Users with a full copy of the file are known as 'seeds'. A new feature, BitTorrent Speed, is due to be introduced to start adoption of BTT. This new layer will enable users of the BitTorrent network to make BTT payments to each other, as a way to get ahead in queues and download files more quickly. This allows seeds to earn BTT for keeping their file active on the network for longer. BitTorrent Speed is intended as a way to use financial incentives in order to optimize the allocation of computing resources on the network. It will make use of a bidding system, which will initially be simple and mostly automated, but will be developed more with later releases. This BTT market "will enable users to advertise their bids within a swarm and trade BTT in exchange for continued prioritized access to seeds. The intended result is that peers will choose to seed for longer, leading to better swarm longevity and faster download speeds for all swarm participants." Other uses for BTT are due to be implemented, in order to more fully develop the eco-system. These BTT Services are all based around the idea of "allowing users to store value from sharing small amounts of infrastructure in order to spend it later". -"A decentralized content delivery service to enable service requesters to advertise bids and pay BTT for bandwidth to receive a particular piece of content"
-"A decentralized storage service to enable service requesters to pay for storage over time"
-"A decentralized proxying service to enable service requesters to pay a client for retrieval of content by URL", which will "allow clients with intermittent connectivity, such as mobile users relying on wifi, to reliably retrieve web resources without needing to maintain an open connection". In the long-term, the BitTorrent protocol will be opened up to third-party developers to create new applications in order to meet specific demands. These developers, and the platforms they create, will also be incentivized by BTT. BitTorrent and the TRON Foundation apparently envisage a fully-functioning economy of BTT micro-payments developing organically over time. This has been the aim of many crypto projects in the past, although few have had a network as popular and firmly established as the BitTorrent filesharing service to build on. As solid as its heritage is, it is still unclear just how successful the BTT project will be, particularly with its use of the TRON network as the underlying technology. One former BitTorrent exec quit some time after the partnership with the TRON Foundation, describing the TRX blockchain as "basically a marketing machine layered on a very thin veneer of technology", and claiming there was "no way" that it could handle the transaction volume needed for BTT. Many in the community seem to be equally sceptical about BTT, suggesting that the token's trading success could just be due to a speculative pump of a hyped new token, as opposed to any real faith in its fundamentals. Questions have been raised about the usefulness and practicality of the token, and there are obvious legal concerns with trying to monetize the intellectual property theft that is at the heart of BitTorrent. - Copyright infringement becomes a CRIMINAL offence when you make money doing it. Is it really worth risking ARREST and a criminal record? So, is BTT in the middle of another Justin Sun hype cycle, giving false hope to investors during this harsh crypto winter? Or is the tokenization of such a high-profile filesharing service the start of a new crypto success story? What do you think for the future of BTT?